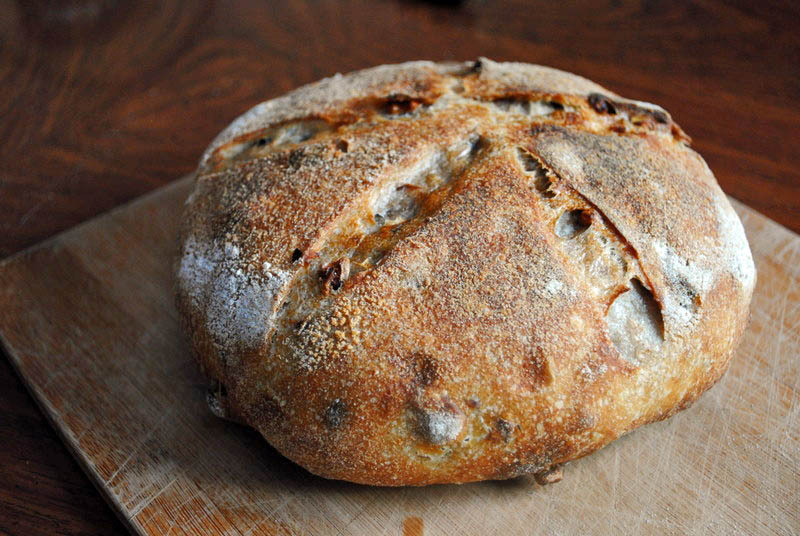 Make the levain by mixing all the ingredients and kneading lightly to form a smooth dough. Keep at room temperature for about 12 hours (it should at least triple in size). Make the dough by combining the three types of flour with the water. Cover and let the mixture rest for 30 minutes. Add the salt and the levain (half of it only!) and knead a few times until it forms a shaggy mass. Add the nuts and knead briefly to incorporate them. Let it rest for 30 minutes, knead for about 10-20 seconds, and let the dough rest for another 30 minutes. Knead (or fold) a few times, and let the dough rest for 1 hour. Knead (or fold) a few times, and let it rise undisturbed for 2 hours. Pre-shape the dough as a round ball, let it rest for 15 minutes, then shape it in its final form, placing it in a banetton or another appropriate, well floured container, with the seam side up. Cover and let it rise for 3 hours. Invert the dough on parchment paper, slash the surface, place on a baking stone on a 425 F oven, covered for 30 minutes, then uncover and bake for 15 minutes more, until dark brown and the internal temperature is at least 205 F.
Let the loaf cool over a rack before cutting. 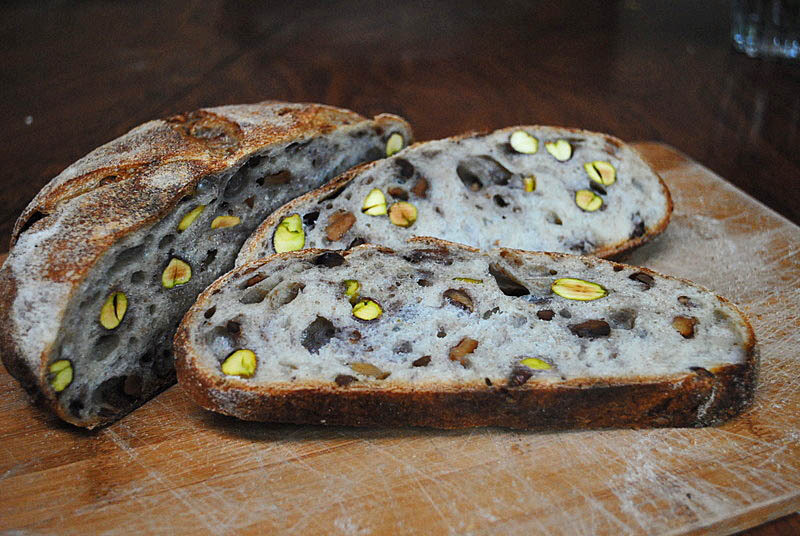 Comments: Making this bread was a labor of love, because I shelled the pistachios myself. My finger tips had quite a workout, so next time I will buy shelled pistachios to make life a little easier, and I advise you to do the same. At any rate, this bread is a nut-lover’s paradise. The pistachios shine like little jewels, and the walnuts become almost sweet during baking. I could not be happier with it, as it turned out exactly as I hoped. Plus, it was another successful performance by our Breville toaster oven! Oh Sally, that looks divine. Our son has a severe pistachio allergy, so I’m admiring from a distance.. This sounds and looks wonderful! Any recipe that takes you back to Paris must be wonderful. 😉 Is it difficult to make a sourdough starter? I’ve read a lot about them, but haven’t tried one yet. If you decide to go for it, and need some help, advice, drop me an email! You maintain two starters? What’s the difference and how do you choose? When we came to LA, I brought Dan with me and left Arthur frozen at home – so Dan is the only one used in LA, in my visits back to OK I immediately thaw Arthur and put him to use. I wanted to get King Arthur’s sourdough because it is a culture that has been going on for 250 years, I thought it would be nice to have it, but to be completely honest, they both behave about the same, I think Dan is slightly more “acidic”, but I haven’t measured the pH. It’s something I could do once I’m back in OK for good. Gorgeous looking bread! I’ve been dabbling in bread making, but I haven’t tried sourdough yet. Was it worth it’s work intensive-ness? Thanks Sally! I’m going to give this a shot sometime in the next month. I’ll let you know how it goes and if I have any questions. 🙂 Thanks!